Today we release a new track called "Raveshadow", the first release since their acclaimed 2012 album Mean Sun. It is accompanied with a video (above) that was filmed near Vienna. It tells the story of two close friends, based on a true story of two 30-something males. The choice of cast and styling is also a persiflage on the cliché of how women are portrayed in music videos and how certain activities are subconsciously connected to gender roles. The video was premiered on Wonderland Magazine. The song blends rock, pop, jazz, electronic, and a seemingly new direction, while maintaining the warmth and complexity that they are known for. The single is being released via Hybridity Music (NA) and Tin Angel Records (UK) today - Thursday, July 28. The band hints that the release of their third studio album is on the horizon, and definitely before the end of this year. If this track is saying anything, it’s that we can expect the forthcoming album to be a mind-meld of styles and emotions that form a brave new direction for a group already known for charting its own orbit. Originally formed Edo Van Breeman and trumpetist Bryan Davies, the duo slowly evolved into a 6-piece band. After a three-month residency at the Banff Centre they emerged with their debut album Mt. Chimaera and took to the road. The band has toured extensively in Europe and North America, including Festival appearances at Iceland Airwaves, Pop Montreal, SXSW, The Great Escape, Incubate Festival and many more. Members include Bryan Davis on trumpet, Edo Van Breemen on keys and vocals, Sam Davidson on clarinet and EWI, Tariq Hussain on lap steel & electric guitar, Brennan Saul on drums and John Walsh on bass. Speaker Face released The Bern x Speaker Face EP in support of Bernie Sanders campaign. A free download will be given to people who have donated any amount to his campaign. You can use any form of social media to show the band a proof of payment. Use the hashtag #BERNxSPEAKERFACE or email your image to speakerfacebooking@gmail.com. We are excited to announce the September 18th release of HYB023 with Toronto-based ambient-electronic duo Snowday. The Evoke EP is the follow up release to their full-length debut album As We Travel. Snowday aka, Cam Sloan and Chad Skinner, have been making music together in various projects since meeting in high school in Ottawa. Their bond over a mutual love of underground hip-hop led them into sample-based production. Since As We Travel, the group has moved into a large studio space in Toronto where they have evolved as writers and performers. Snowday came upon the inspiration for the project in an unlikely source – a ukulele they picked up in Madrid, Spain while travelling Europe together. Without a studio to record in while on the road, Cam Sloan and Chad Skinner found a new creative spark in going back to basics and jamming with small acoustic instruments they collected throughout their travels. This new found appreciation for acoustic textures and live playing greatly coloured the material they recorded once they returned home, which ended up becoming Snowday's first songs. Their closest musical relatives are chilled out electronic artists like Bonobo and Tycho, with occasional nods to ambient pioneer Brian Eno and minimalist icon Steve Reich. Humans Remix "Young Empires - The Gates"
A fresh Humans reconstruction of Young Empires' dream scape "the Gates". Deep, dance floor friendly, with hints of an acid house influence only serves to strengthen a stunning vocal performance from Young Empires front man Matthew Vlahovic. Cafe Lanai is a duo in paradise. Friendship and music at once led vocalists/producers Michael Brock and Forever to adventure together to Pahoa, Hawaii. Originating with the absorption of tropical sounds and antiquated island imagery, the project made a “ sweet, sweet double espresso debut” with their deep first single ‘Lanai’. On their five-track ‘Paradise’ EP, Cafe Lanai enlists the spirit of humid rain-forests and black sand beaches, imploring you to close your eyes and throw your body to the beat. The tracks are infused with interweaving vocals, sultry lyrics, sweaty synths and rhythms for house heads and disco souls. The duo released their first video and debut single, Lanai, with Thump/Vice in March of this year. This strong debut instantly solidified a unique visual and sonic aesthetic, finding it's way to BBC Radio6, and Gorilla vs. Bear. Their second single, "So", was released with Resident Advisor last week. The accompanying video will illuminate Part II of their intimate low-fi paradise. Most recently, their music was used as the exclusive soundtrack for Blood, Sweat and Queers, a documentary that portrays the story of cultural unity and activism at Toronto Pride Week, and was released at that time. For streaming/downloads, photos, press highlights and more, click here. Paradise is available in digital formats as well as 12" vinyl format through our Bandcamp store. Humans remixed "Break You In" for Savvie. Read more and listen via Exclaim! 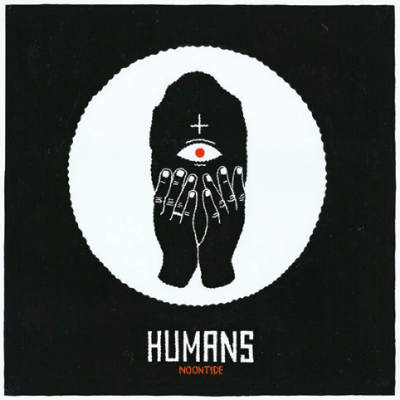 Humans premiered the video for "All My" via Flavorwire. Cafe Lanai's "Lanai" was featured in the March 2015 episode of Lauren Laverne's MPFree segment for BBC Radio 6 Music. Today we are very excited to deliver Noontide–a new full-length offering from Peter Ricq and Robbie Slade. After just surpassing our 20th release as a label, its fitting, upon our 3 year anniversary, that we should come full circle with Humans' Noontide. Hybridity has pushed through the years to put out music that is both eclectic in its sounds, while keeping electronic composition and instrumentation at its core. 'Noontide' exemplifies this as a whole. The work that both Peter and Robbie put into this album is incredible. They've spent years working through each track (and sometimes longer), and then went into the studio with Nik Kozub where they spent weeks on end focused on creating what is a timeless album and a testament to their musicality and ethic. Like all Humans albums before, the artwork is done by Peter, and in an interesting twist this cover shows the pose Robbie is so well known for in a moment of excitement, and quite fitting a time such as this long anticipated album. It's with great excitement that we release 'Noontide' today, which is at its core genre agnostic through space and time. Michael Brock and June Moon, a.k.a. Cafe Lanai, have debuted the video for their new single “Lanai” via Thump. Ladyfrnd’s Farewell EP is due out on Hybridity Music on May 12th.